JC Equipments are the leading manufacturers of Plate finned type Heat Exchanger in India, located in coimbatore south India. Established in 1989 to manufacture and export all types of industrial heat exchanger in INDIA. 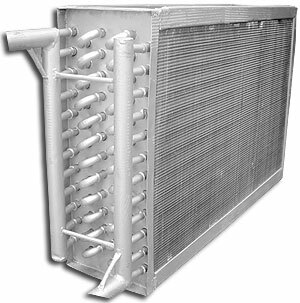 The heat exchangers are commonly useful in industries where the fluids have small chances of fouling. Our heat exchangers can be made in a various of materials. plate fin heat exchanger manufacture are the same for all sizes and all materials. We are the leading manufacturers of Plate finned type Heat Exchanger in India. 5. Compressor Inter cooler and After coolers Oil refineries, Power Plants, Food Industries and Processing Industries are mainly using the Plate Finned Type Heat Exchangers for Condensation and Refrigeration purpose. Aluminium Plate Finned Heat Exchangers : The heat exchangers are developed by vacuum brazing technology and the heat exchangers as single units or as manifolded assemblies, isothermal reactors for chemical Plants and Coil wound heat exchangers and petrochemical industry plants. Plate Finned Heat Exchangers Comparison with Shell and Tube Heat Exchanger. A Plate finned heat exchanger with 6 fins/cm provides approximately 1,300 m2 of surface per m3 of volume. This heat exchanger would be approximately 10% of the volume of an equivalen shell and tube heat exchanger with 9 mm tubes.